TILIGO is the application which revolutionizes the offer creation process! Its implementation helps to shorten preparation time, at the same time increasing the precision of valuations. The so far arduous task of preparing complex summaries on the basis of many data sources, price-lists, and making complicated calculations can now be fast and easy thanks to using TILIGO. 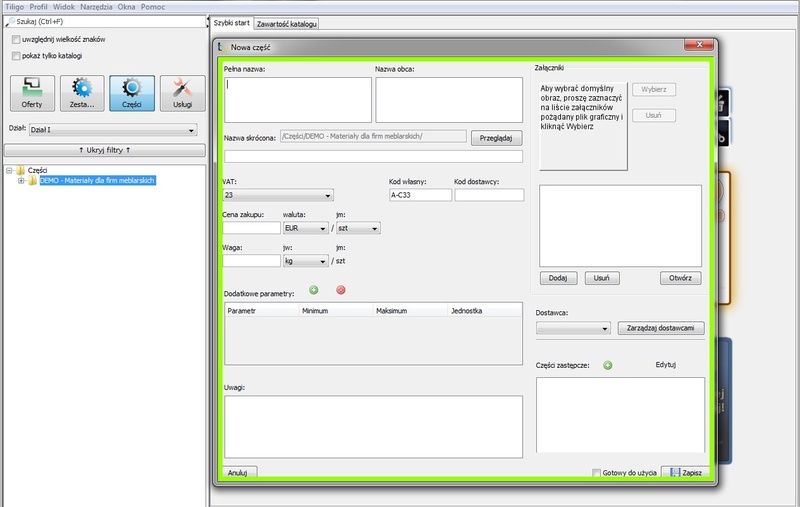 TILIGO can be easily integrated with existing software for companies. Contact us to know how TILIGO can cooperate with the program that you use. The program is compatible with Microsoft Windows XP, Vista, 7, 8. Begin the work by making a detailed description of all products which will be used to build offers . …but you can also add complex formulas..
…you can also describe them with very complex formulas and make the service cost from many factors. Context-sensitive help and an intuitive form will help you with everything! 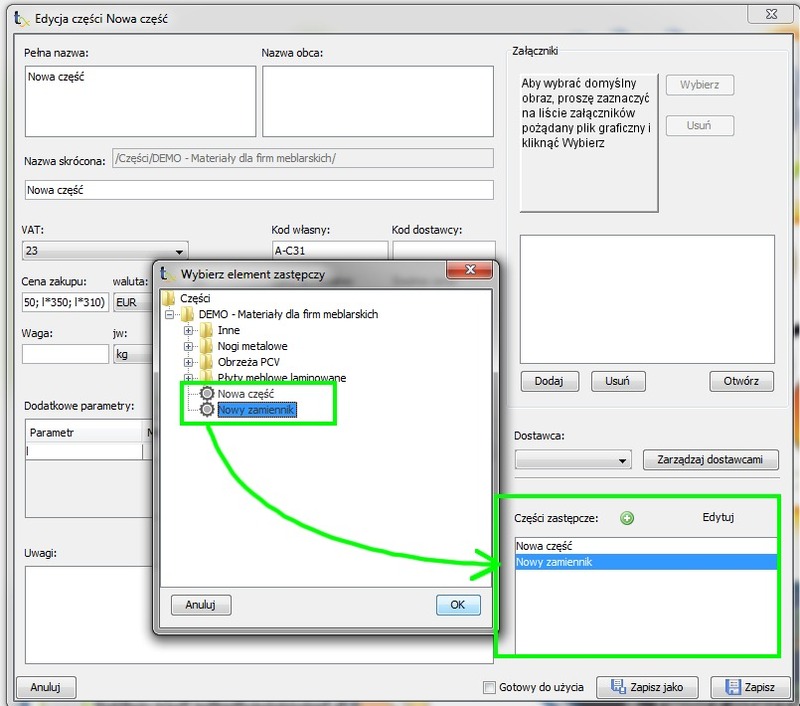 The basic parts which are connected with services create the most commonly used modules in the implementation of projects, which in Tiligo are called “sets”. An intuitive form is used to create them. It’s enough to drag the parts and services defined earlier to the form in order to create an independent module – a set. You can define individual mark-ups on each component. There are more or fewer advanced options available to describe a set. Create offers faster then ever! If you have defined the above components, you can quickly create your offers by dragging the selected positions to the form in order to generate the offer. At this stage you can individually set mark-ups on each offer component as well as on the whole project. While reducing the risk of underestimating or overestimating your project you optimize your profit! …you can as also describe them with very complex formulas or make the service cost from various factors. Now you only need to print it and give to the customer. The basic application of TILIGO is pricing products or whole projects and creating professional commercial offers. Ability to independently develop an offer print template. This template can contain any amount of graphics. 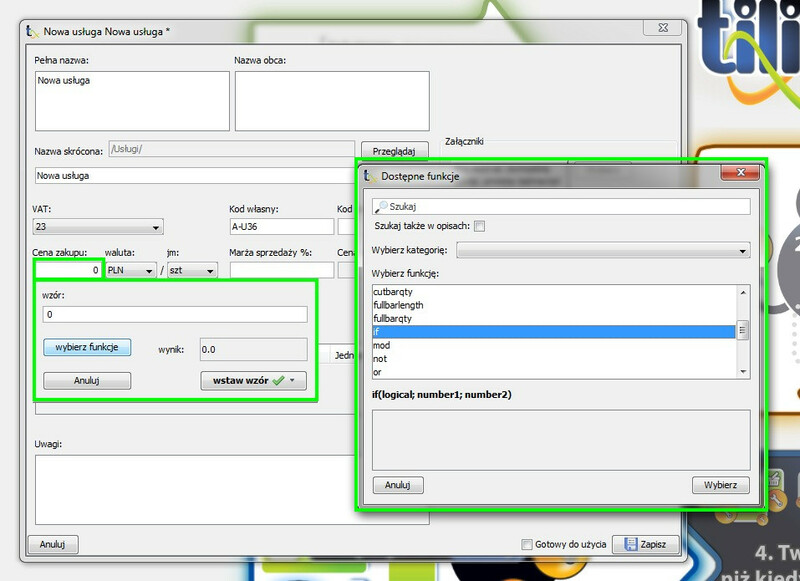 The program itself places the data in the template. The offer is exported to Word, WordPad or another compatible program, allowing for the eventual viewing and editing prior to printing or conversion into an Adobe PDF form. You can print or send an e-mail of the prepared offer to the customer. Virtual store, in which the used parts of hedged resources are recorded, which do not necessarily have to be currently held by the company (e.g. they are in our store or supplier offer), which is an advantage over competing TILIGO programs. In this store you can update prices, names and many other parameters. You can also tie some parts as an alternative. Offers can be saved, printed or exported to another program after you have formulated them. Each part may have so-called parameters. They allow you to describe additional characteristics of the product that can later be used in a variety of calculations. The parameters may be, for example, length, width and height of the item. 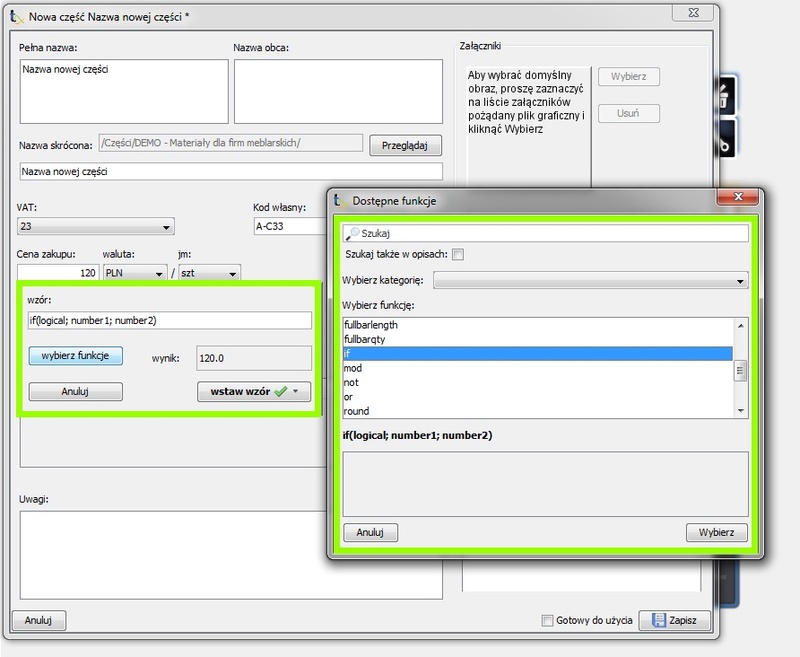 The program allows you to create so-called sets. A set is any set of parts, services, or other, which greatly facilitate the work when the group parts and service award is used to create different offers. Each set can contain not only the basic parts but also other sets. In the case of a company producing bicycles, the part component could be a wheel. The factory needs many parts to produce it and will form the component set of the wheel, therefore it is not worth offering each part separately. It is enough to give one set of a complete wheel. If the price or description of any component set of this wheel changes in the virtual store, then the price of the whole wheel will automatically change. Versatility in sorting components included in the offer. An example could be sorting by vendor, which effectively means that we can obtain a list of grouped parts of suppliers. If it turns out that the supplier does not have any given part, this gives you the opportunity to choose an alternative part in TILIGO (if one has been previously defined). Finally, we obtain (print or e-mail) an ordering list to suppliers. You can attach the photo (s) and any files to each virtual (or set) part. Therefore, you have full knowledge of each component’s virtual store. 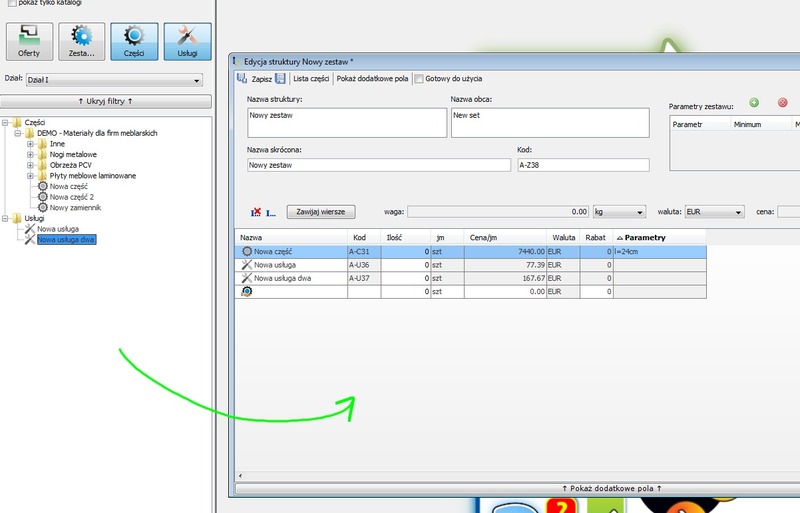 In Tiligo you can create sections, allowing them to work in such a mode that the employees of one department cannot see the offers of another department store. Tiligo can operate in network. The program allows you to define rights for each component, which allows the administrator to decide what anyone can do / change. Tiligo gives you the ability to save listing components invisible to the customer on his offer. 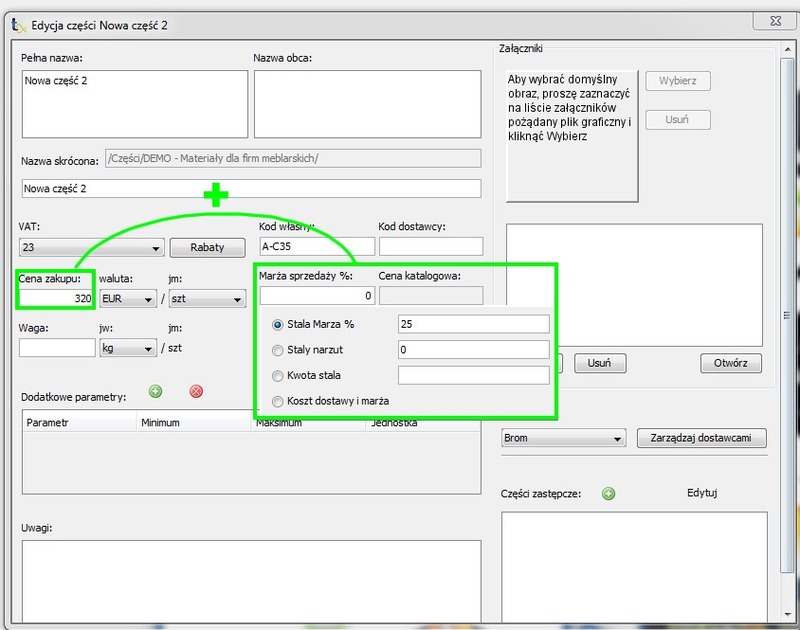 You can create different calculations which are stored in the offer, but only the results of these calculations will be visible to the customer. Components of the set must not be visible in the final offer, but if necessary it is possible to make them visible. 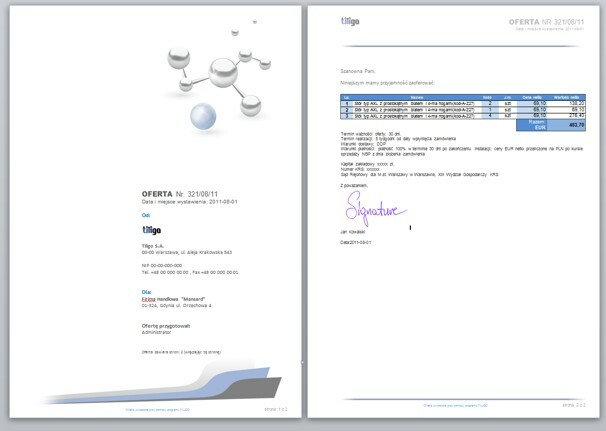 Tiligo creates not only the offer, but also other documents such as order to the supplier. The set can be placed in the so-called global parameters (applicable for the entire set). Changing global parameters may accordingly result in changes in the parameters of individual components. Global set parameters can be “exposed outside “(visible through an offer or master set). Thus, we can set global parameters containing the above-mentioned range from the offer level. This makes it possible to influence the shape and content of a set contained in the offer. This in turn affects the price of this set. you can create so-called lists of alternative parts (alternative sets) in the designed sets . For example, creating a set that describes a certain model of a new car of, it is possible to additionally choose any bodywork colour, engine type, transmission type, and any other parts that may be an alternative in the model. Through this function we are offering superior performance in a variety of products containing variants. …takes only a moment with TILIGO!